The Blair Witch Project, the eighty-minute indie trek into the found-footage genre filled with yelling and tears, shaky camerawork, and a slow but assured build of real-world tension, has always been a bit polarizing. Some bought -- and continue to buy -- into the illusion created by Daniel Myrick and Eduardo Sanchez, viewing the grainy film and muffled audio as an authentic relic left behind by three doomed documentary makers in search of Maryland's fabled Blair Witch. Others see it as nothing but hype pushing forward a not-so-scary horror film made exasperating by its frustrated characters. Perhaps my initial impressions were impacted by the fact that I originally screened the film at a rural drive-in theater nestled against a forested area, but I fall into the first category, seeing The Blair Witch Project as both an expertly-crafted novelty and a genuinely chilling horror experience. 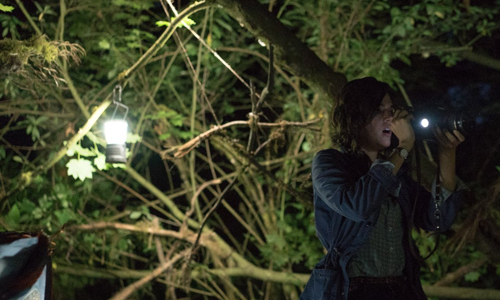 That's why the reveal of this surprise sequel to the Blair Witch saga, directed by You're Next's Adam Wingard with a clear grasp on what the original did right, generated plenty of excitement toward returning to the woods. The result, the simply-titled Blair Witch, finds another, larger group of inquisitive youngsters entering into the Burkittsville forest to follow in the tracks of the original trio. This time, the hunt for the Blair Witch is by association: fifteen years after his sister Heather, the head documentarian from the first run of discovered footage, went missing, James Donahue has gathered together a group of his friends to take one last journey into the woods in hopes of finding her. Sparked by new videotape footage discovered and uploaded by a pair of YouTubers that revealed what could be the image of his sister in a dilapidated house, James and his tech-savvy film student friend, Lisa (Callie Hernandez), arm themselves and friends Peter (Brandon Scott) and Ashley (Corbin Reid) with state-of-the-art recording -- and global positioning -- gear to capture their experiences. With the YouTube uploaders Lane (Wes Robinson) and Talia (Valorie Curry) tagging along, the group of six enter the Maryland woodlands with awareness of the superstitions and schemes used by the woman of the forest, real or not. Multiple headset cameras, a footage-capturing drone, and a high-quality DSLR elevate the quality of the discovered material in Blair Witch, offering perspectives that differ from the original film that double as modern solutions to the issues encountered there, too: how to shoot continuously, keep from getting lost, etc. Along with GPS devices and the spottiness of cell-phone reception, it's as if director Wingard and writer Simon Barrett wrote down a list of each and every way that the trio in Project could've gotten out of the original situation had it happened in the current era -- the reasons why it might appear dated now -- and preemptively addressed all the scenarios. But for all the technology at their fingertips, this new winding hike through the witch's domain still manages to play out curiously similar to the original, where the crew deals with many of the same problems and get embroiled in many of the same arguments over mistrust and navigation. There's a fine line between respecting and disguising a franchise's roots, and falling into the zone of duplication. This direct sequel stumbles across that line, repeatedly. Despite the advancements in recording tech and the new toys at their disposal, Blair Witch retains a lot of the same jerky editing and wobbly camerawork you'd expect from the frantic movement of frightened people, so those who were bothered by it before won't have their minds changed here. Something's different this time around: a lot of effort went into creating as much authenticity as possible in Project to maintain the prankster guise of it being, y'know, feasible real, which are limitations that Adam Wingard doesn't have to so stringently respect; he's purely conjuring the illusion, not trying to swindle the audience into thinking this all really happened. With that freedom, he uses harsh glitches in the digital footage and loud bumps in the night for precise, boisterous jump-scares. These jolts are effective at creating an unpredictable and punishing landscape that's more openly exciting than it was before, but they also feel manufactured inside an experience that's still trying to walk and talk like found-footage horror, subtly interrupting and undercutting the film's general conceit. 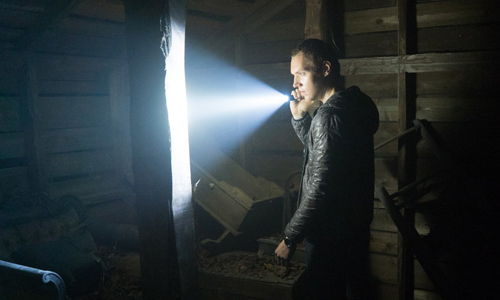 By focusing more on these direct, hostile scares, Blair Witch also tweaks the methods used by the titular monster of Maryland's folklore, to a degree that comes close to being inconsistent with what happened in the woods fifteen years prior. In The Blair Witch Project, the witch was insidious and eerily manipulative; this time, she's outright angry, and exerts far more control over her domain than before. Perhaps a decade-and-a-half of search parties trampling through the land have further embittered her, but the terror she generates around her new victims is much more visceral and unabashed, an after-effect of those deliberate scare tactics. Even with this metamorphosis of her methods, however, very little demystification of the Blair Witch occurs, an impressive feat for such a sequel. While retaining many of the original mysteries, it also introduces a few of its own with enough obscurity to invite theories about what's really going on. Lifelike creepiness has escalated to Lovecraftian horror, and while reasonably potent, this transition within the found-footage genre isn't without missteps. The heightened brutality of the Blair Witch makes it a lot easier to not get invested in the band of seemingly doomed travelers searching for her, a cluster of well-performed but bland and sporadically unlikable people more easily viewed as potential horror-film victims than anything else. Aside from James' motivation to find his sister, there isn't a lot to these characters, which makes their progression further into the witch's twisted realm less about their individual interactions with the Blair Witch folklore and more about the deadly tricks awaiting them in the pitch-black surroundings. This matters less in the final act, a culmination of the dwindling number of campers and the object of their pursuits, one that frantically messes around with expectations and crawls deeper into the mysterious foundation built by the enigmatic ending of the first film ... but you've got to get there first. Blair Witch fittingly extends the woods' dangers and ill-omened mythology, yet director Wingard can only partly recapture the landmark spirit of the footage cobbled together from those three original documentarians.